An electric subsea cable between Iceland and Europe is currently being considered. The cable, sometimes referred to as IceLink, will be approximately twice as long as the longest subsea electric cable today, which is the NorNed cable between Holland and Norway (NorNed is 580 km, with a capacity of 700 MW). It seems likely that we will soon see a substantially longer cable than the NorNed, which will be a new cable between Norway and the United Kingdom (this new cable will be more than 700 km long, with a capacity of 1,400 MW). However, an even more ambitious project is being planned in the Mediterranean; the EuroAsia Interconnector. The EuroAsia Interconnector project aims to link the power grids of Cyprus, Greece (including both Crete and the Greek mainland) and Israel. The total length of the cable will probably be between 1,000 and 1,500 km, and have a capacity of 2,000 MW. 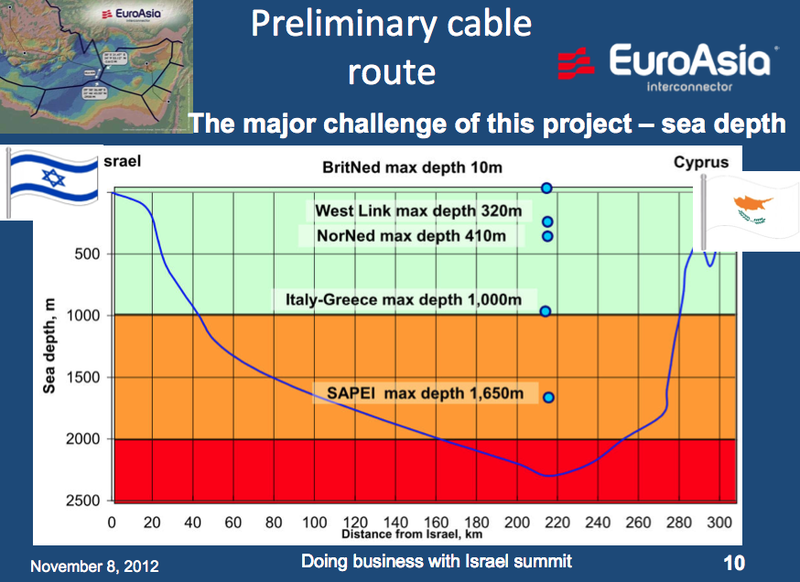 It will travel through an enormous depth of more than 2,500 m.
Firstly, a 330 km cable will link Israel with Cyprus. Further, Cyprus will be connected with the Greek island of Crete via an 880 km long cable. From there Crete will be connected to Greece via a 310 km long cable, providing a connection to the pan-European electricity grid. 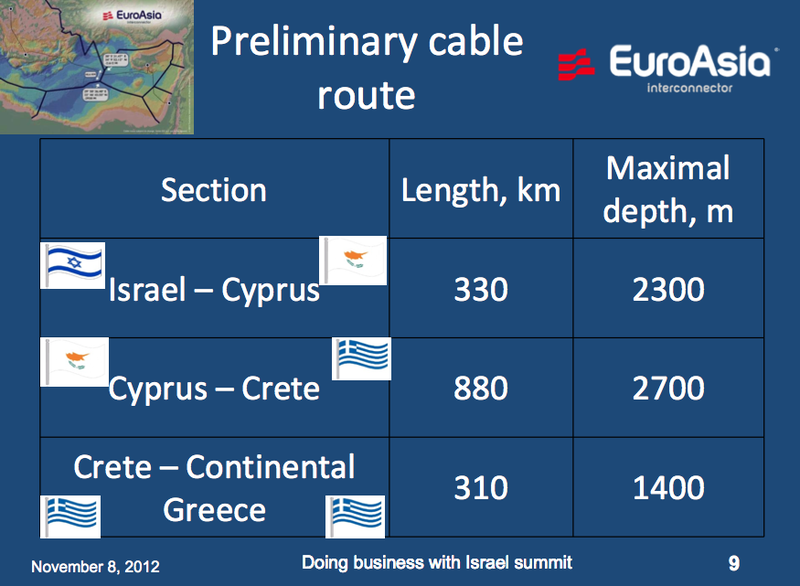 In March 2012, Cyprus and Israel initiated a feasibility study to explore the possibility of the EuroAsia Interconector connecting the grids of the two countries. The project is expected to be completed in 36 months from the start of construction. The interconnector will be funded and developed by DEH Quantum Energy, a joint venture consisting of Greece’s DEH and Cyprus’ Quantum Energy, with the Bank of Cyprus as a minority shareholder. 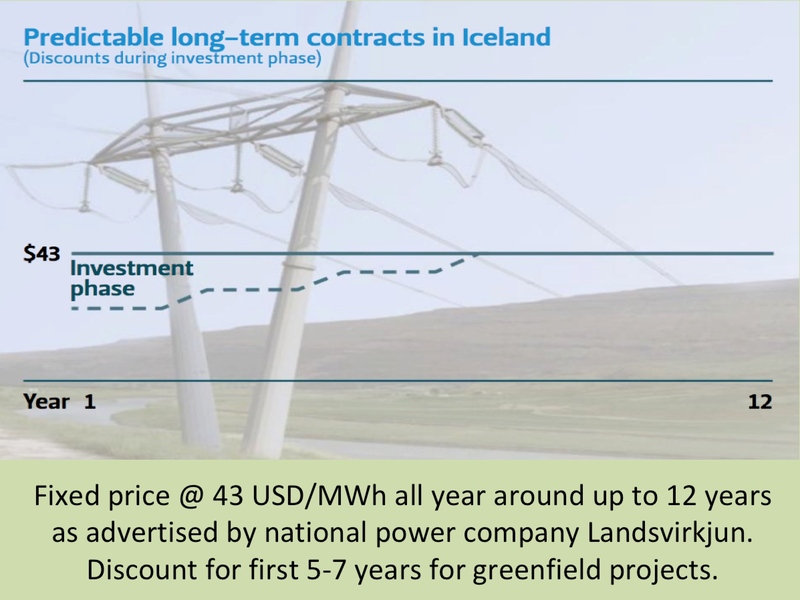 In comparison with the EuroAsia Interconnector, the IceLink between Iceland and Europe seems to be a very positive and even a simple project. While the EuroAsia Interconnector will mainly transfer electricity generated by burning natural gas, the IceLink is based on renewable hydro- and geothermal power. 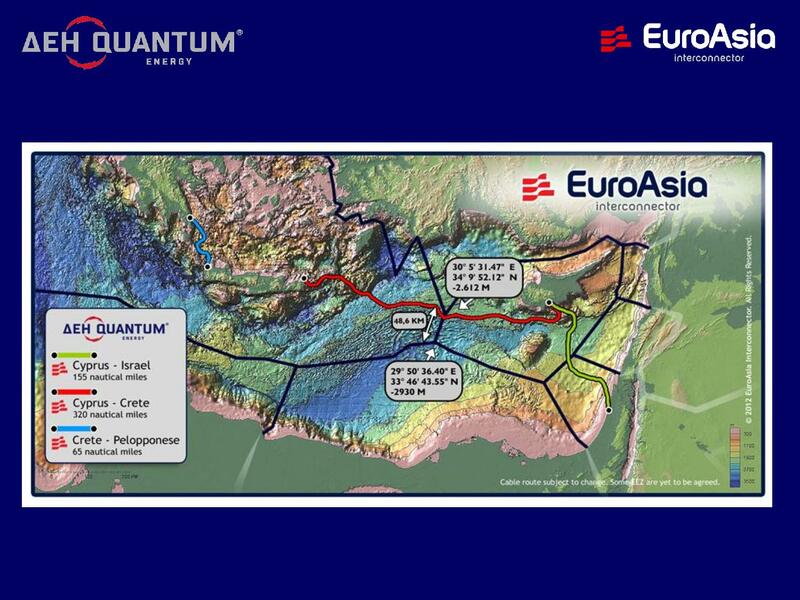 The IceLink is likely to be close to 1,200 km (if connecting Iceland and UK) and the maximum depth of the route is close to 1,000 m. As the depth is one of the main challenges for subsea electric cables, it is interesting that the EuroAsia Interconnector will be at more than twice as much depth as the IceLink. The EuroAsia project has recently been added to the European Commission’s list of Projects of Common Interest (PCI). This recent list of 248 key energy infrastructure projects was adopted by the European Commission on 14 October 2013. These projects will benefit from faster and more efficient permit granting procedures and improved regulatory treatment, and may also have access to financial support from the Connecting Europe Facility (CEF). The CEF has a budget of EUR 5.85 billion that has been allocated to trans-European energy infrastructure for the period 2014-20. The current plan is to have the EuroAsia Interconnector up and running as soon as 2017.